Miles Morales and Gwen Stacy are bursting into your homes this week with the Spider-Man: Into the Spider-Verse Blu-ray. 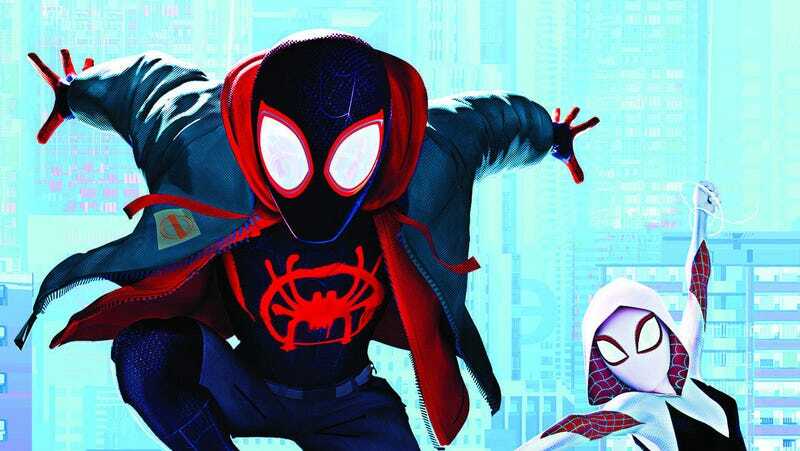 In an alternate universe, the Oscar-winning Spider-Man: Into the Spider-Verse had a different opening, new ways for Miles Morales to figure out his powers, a creepy introduction for Peter Parker, a plane ride, and even another Spider-Man movie inside the movie! And guess what? That alternate universe is real, thanks to the Blu-ray release. You can see all that and more on the new Spider-Man: Into the Spider-Verse Blu-ray, which is now available. It has a solid selection of traditional special features, such as mini-documentaries, interviews, director commentary, Easter egg revelations, music videos, and more. The main event, though, is called “Alternate Universe Mode,” which is an extended version of the film, hosted by producers Phil Lord and Chris Miller. Instead of just letting you watch different scenes on their own like most home releases do, the “Alternate Universe Mode” intercuts numerous alternate takes, deleted scenes, and even some new characters and side stories into the movie. Most are seen in very, very crude, hand-drawn storyboards with scratch voices over them, but the additions take the 117-minute film up to around 140 minutes. While completely fascinating, the experiment works mostly to prove that the movie released in theaters is exactly how it should be. Here are the biggest changes in the alternate version of Spider-Man: Into the Spider-Verse. Spider-Ham kicks things off in the Alternate Universe cut. Instead of just opening with the titles, the Alternate Universe version of the film opens with the “Spider-Ham: Caught In a Ham” short, which not only makes the whole package feel like an old-school night at the movies, but also shows what Ham was doing he got pulled into Miles’ world. In the comics, Ganke is Miles’ best friend and the one person who knows his secret. However, he’s not in the final movie at all. That’s because the Ned character in Spider-Man Homecoming was so directly influenced by Ganke that the filmmakers didn’t want audiences to think they were ripping off that film. Even if it was, in a way, the opposite. So he was cut very early on. Ganke is all over the Alternate Universe version, though. First, he and Miles meet in a music room where Ganke almost gets bitten by the spider that’s stowed away in Miles’ backpack. And in this version, that’s when Miles himself gets bitten, not in the subway tunnel. Later, once Miles has begun to exhibit powers, Ganke has to try and unstick him from the ceiling by any means necessary (butter, crowbar, Vaseline). At that point, Ganke is convinced Miles is Spider-Man, though Miles isn’t quite sure. While Sam Raimi’s Spider-Man isn’t directly replicated in the Alternate Universe, Spider-Man: The Motion Picture is certainly a homage. To convince Miles he has the same problems as Spider-Man, Ganke takes Miles to the library to watch Spider-Man: The Motion Picture. Miles suggests they just watch it on YouTube but Ganke goes off on a diatribe about he doesn’t like to bootleg movies. The film (which we see in storyboards like the rest of these scenes) is directed by Will Gluck (Easy A, Peter Rabbit) and stars fictional actor Todd Crews. As they watch the movie, Miles and Ganke turn on the director commentary which is Gluck along with the real Spider-Man, who it’s explained was a consultant on the film. They watch a scene where Peter Parker gets stuck in a Maserati, and on the commentary, Spider-Man explains how, at first, he couldn’t unstick himself from things. That finally convinces Miles he really is like Spider-Man. Oh, and both Ganke and Miles agree the movie is terrible. A few times in the Alternate Universe cut, Miles has nightmares about what’s about to come. He sees visions of dangerous, inter-dimensional portals, losing his family, and more, before waking up in a panic. Somehow, Kingpin is even more sinister in the Alternate Universe. There’s a messed-up addition when, during Mary Jane’s speech after the original Peter Parker dies, Wilson Fisk takes the stand and says he’s making a sizable donation to local law enforcement to help bring down the people who killed Spider-Man. Miles knows it was Fisk who did it and the enormity of his task, to defeat him, scares him silly. Once Miles is sure about his powers, he and Ganke go back to watching Spider-Man: The Motion Picture to see how movie Spider-Man learned to be Spider-Man. They realize that Spider-Man always nailed his moves, like swinging and sticking to walls, on the third try, so they figure that’s the trick. But of course, it’s not. Miles fails again and again and again, which is cross-cut with Peter’s successes in The Motion Picture. Miles also tries to use his web shooters like a fishing pole or bullwhip, but none of it works. It’s almost as if he needs a teacher of his own. Put on some pants, Peter. Peter B. Parker’s entry into Miles’ world is given a little extra time in the Alternate Universe cut. Once he’s sucked out of his own dimension, he lands in Miles’ dimension...without any pants. A kid sees him and screams so Peter grabs the first thing he can to cover up, which is a jackhammer. The cops are called, Peter is arrested and they joke about the size of his “bits.” Finally, he asks for them to open the window, which they do, and he shoots web outside and escapes. In the diner, once Miles and Peter realize who they are, Peter explains to Miles how the dimensions work with ketchup and mustard. As he lays out the plan, he calls it “Spider-Man: Homegoing,” which not only makes sense, it’s a meta joke about the recent Marvel live-action film. Flying to the Hudson Valley makes no sense. Flying in the Hudson Valley though? A thing of beauty. Once, the Spider-Men realize they have to go to Fisk’s lab in the Hudson Valley, they don’t take a bus, they take a plane. (Which, as someone who grew up in the Hudson Valley, makes little to no sense. It’s like a three-hour drive, max, plus there are only a handful of small airports. It’s not cost or time effective.) They to go JFK, get on the plane, and Peter gets mad at Miles for asking him Spider-Man questions in the cabin, so they both sneak into the bathroom and Peter answers some of Miles’ questions there. In the final film, we never see Miles’ dad Jeff and Jeff’s brother Aaron speak to each other. But in the Alternate Universe cut, once Miles has been gone for a while, Jeff actually goes to Aaron’s apartment to talk to him and asks if he’s seen Miles, which he admits to. We also find out they haven’t spoken in two years. The scene ends with a pizza being delivered to Aaron and him using that as an excuse to close the door. The “What’s Up Danger?” scene is certainly one of the best in all of Into the Spider-Verse but, in this cut, it ends a little differently. Everything is basically the same until, while swinging through the street, Miles smashes through a truck and tumbles onto the street, with the music stopping abruptly. It’s a much less heroic ending to the scene than in the theatrical version. In the final film, we just assume Doc Ock is killed by the truck that hits her. But, in the Alternate Universe, she gets back up and decides to throw herself into the void of the multi-verse before Miles destroys the collider, “The power of the multiverse in the palm of my hand,” she says, leaving her story open for another day. While some of that sounds really cool, the problem is that not all of it is necessarily seeded through the end of the movie. The changes, especially the Ganke stuff, never pay off later in the film. And that’s probably because the idea was changed so early on in development that nothing really exists with that character by the end of the movie. So basically this version is not very “good” as a cohesive story and works much much better as an experiment. Thankfully, the whole movie that we got is pretty much perfect—and exists just to give fans some fun little things to check out. Spider-Man: Into the Spider-Verse is now out on Blu-ray.